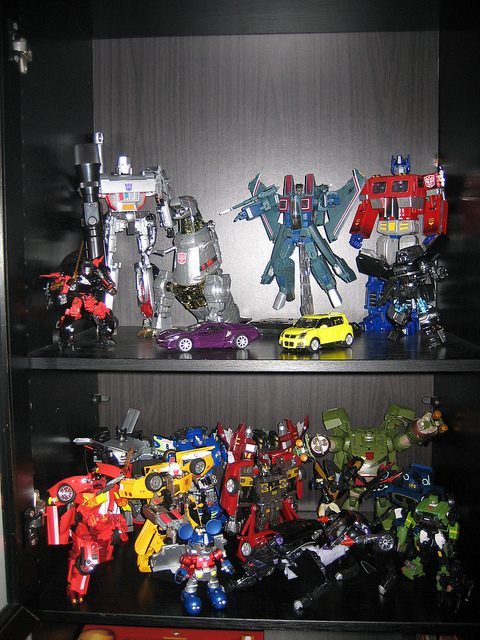 I’ve written here about my Transformers collection, but you may wonder what do I do with them exactly, other than putting together elaborate displays in my cabinet. To be honest, nothing; they largely gather dust (and are horribly difficult to clean, I might add). I had an epiphany the other day that the difference between me now as an adult and me back when I was a child: I no longer give myself the freedom to imagine. Over the weekend I played with Jenny’s cousin’s son, a hyperactive two year old. Both my body and my mind received a thorough workout as we roughed up a stack of Jenga blocks, where the individual tiles were transformed into a pile of bricks, a horde of money, food, cars, trains and planes. Next, we moved onto an etch-a-sketch, where we drew faces, created scenes of day and night, and drew a whole lot of random scribbles from which we’d eke out meaning, like a Rorschach test. We did the same with his collection of toy cars as well as his Thomas the Tank Engines of various sizes (which somehow came to represent members of his family). Overall, about 2 hours of intense play. It was like the opening scene of Toy Story 3 – toys aren’t simply objects to be appreciated for their features and design – they were avatars for the personalities and characters that we invent for them in our imaginations. As embarrassing as it is for me to admit this, I used to play with Transformers in the same way that girls played with dolls. I distinctly remember one Transformer called “Searchlight” that I used to play with a lot, for whom I built a little bed out of a tissue box for him to sleep at night. That’s great if you have the passion and the talent, but what do you do if you don’t?